Major League Baseball has used the seventh-inning stretch to pay tribute to service members during this year’s World Series, with representatives from various branches singing “God Bless America” in front of packed crowds and millions watching at home on network television. Sunday night was Army Sgt. Christine Permenter’s turn, for example, and the Game 1 singer, former Marine Sgt. Dan Clark, brought down the house with his rendition … and nearly melted the Battle Rattle blog’s servers for doing it while wearing a borrowed uniform. 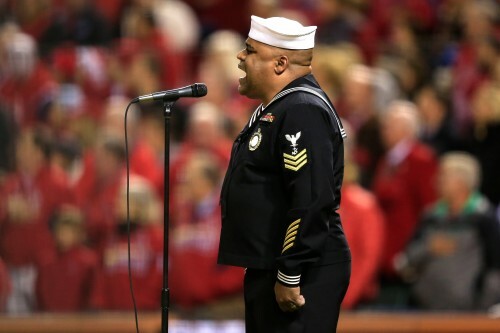 Retired Navy Counselor 1st Class Generald Wilson is no stranger to the St. Louis sports-singing scene — that’s him on the right, knocking out the same song during the 2012 National League Championship Series between the Cardinals and the visiting San Francisco Giants. His big break, according to a Navy.mil news release, came in 2003, when the then-Reserve recruiter belted out the national anthem before a St. Louis Rams-Baltimore Ravens game on a Monday night as part of a Veterans Day ceremony. 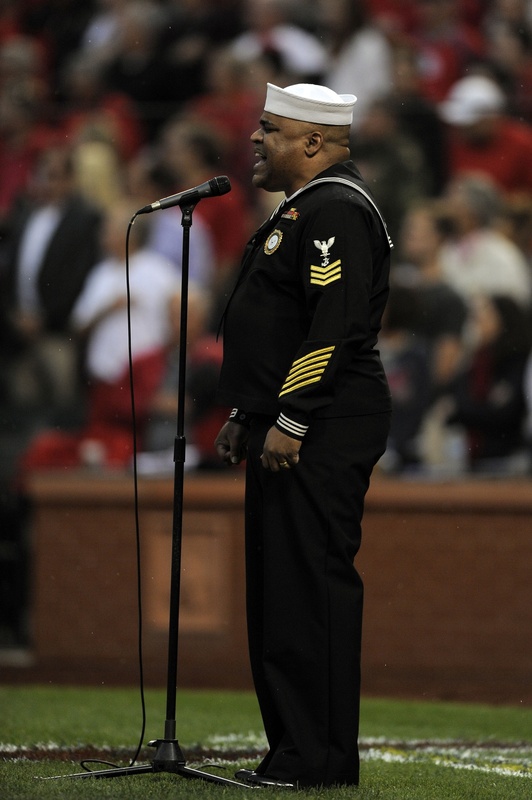 In 2009, his rendition of the anthem kicked off St. Louis’ Navy Week. In 2011, an Associated Press photographer caught this striking shot of Wilson singing the anthem before a St. Louis Blues hockey game. See how Wilson’s version of “God Bless America” stacks up to some other seventh-inning stretch performances here. Get your World Series news here, and follow Wilson on Twitter here. He was absolutely fantastic! What a rich and powerful ownership of that great song! The best I’ve ever heard and I’ve heard many. Thank you for sharing your gifts with the nation, and now even your gifted voice. Thank you Petty Officer Wilson. He rocked it. where’s my puffs I think I got something in my eyes. Bravo Zulu Petty Officer Wilson. Thank you for your service. If your travels take you through the Detroit Metropolitan Airport, please stop in the Freedom Center military lounge so we can thank you in person. There is no doubt in my mind that if the Petty Officer was still on active duty, some sorry low life liberal would be doing all they could to have him sent to Ft Leavenworth with an dishonorable discharge. I’m not American, but that still gave me chills. Nice salute too. Up, two, three, cut. Bravo Zulu, Petty Officer. Well done! Really bringing it home for the Navy and the other branches of the Armed Forces. May God Bless America in these times when people are turning their backs on Him. Dear Lord please help these people to see the light that You shine so brightly down upon us. We know that through You all things are possible.